The most important part of creating content is ensuring that you have a plan to follow. You need to know who your audience is, know the keywords you need to use to attract them, decide upon content types and topics, and then plan when and how they’ll be created and pushed out to your audience. 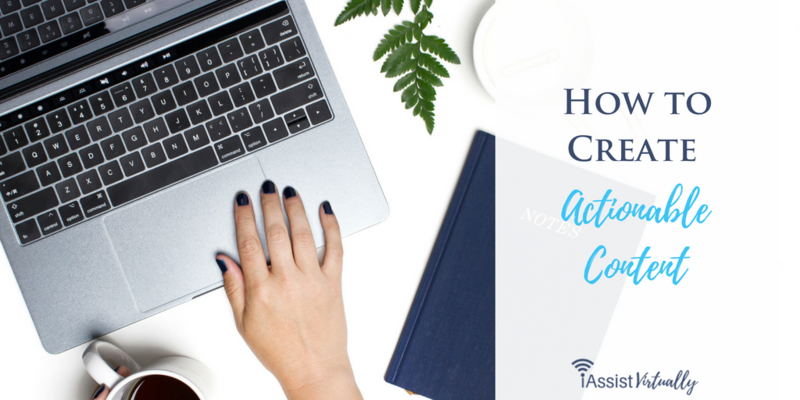 The most actionable content will be the most meaningful content to your audience, which is why they play such a central role in your content development. Your audience consists of a specific type of person. You should know their demographics, location, profession, learning style, and more if you want to craft content that people will act on. If you can create audience personas for each type of content you want to produce, you’ll be able to better form your content. Each piece of content that you create needs to have a reason for being. This may be to sell a new product, promote a new service, and get more subscribers, or something else entirely. It’s important that you know why you’re creating the content so that you can use the right words to encourage action. The KISS method works for a variety of issues and it’s no different for creating actionable content. Explain jargon to your audience and define terms to them, so that there is no confusion about what something means and no mistake about what you want them to do to follow through. How something is laid out depends on how the audience will consume it. Will they be reading the content on a Kindle, in a book, or online? Understand how people read books versus how they read content online. For example, online content needs plenty of white space and other factors that break up the content to make it easier to understand. When you tell people how to do something, they’ll respond better than just telling them what to do. It’s the difference between an expert and someone who is just regurgitating information. Images can evoke feelings, as well as help explain more than words can. You can use graphs, memes, infographics, and other types of images to get your point across and inspire your audience to take action. Your audience has burning questions that need to be answered. If you’re aware of these questions, not only will your audience feel as if you can read their mind, but they’ll also make you the go-to person when they do have a question that needs to be answered. Find questions where your audience hangs out, online and offline, and then start producing content to answer the questions. When most people think of content creation, their first thought is almost always about blog posts or articles. But, there are so many other forms that your content can appear in. Be innovative and think of new ways to present your information and your audience will be transfixed. Finally, remember that your job is to create value for your audience. To create a loyal audience you need to deliver excellent actionable content every time at the right time. By developing a plan of action and planning your content out strategically with purpose, you can deliver value to your customers every single time you post.